40thstreetflorist is ranked > 3,000,000 in the United States. Topics: Real Neighborhood Flower Shops, and Same-day Flower Delivery. Mci Communications Services Inc. D B A Verizon Business (Virginia, Ashburn) is the location of the Microsoft-IIS/6 server. 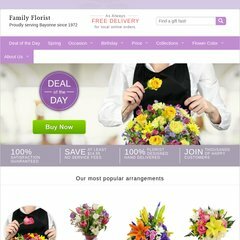 There are 1 Nameservers, eprodns2a.eflorist.com. The programming language environment is ASP.NET.